View of the January 2010 snow. 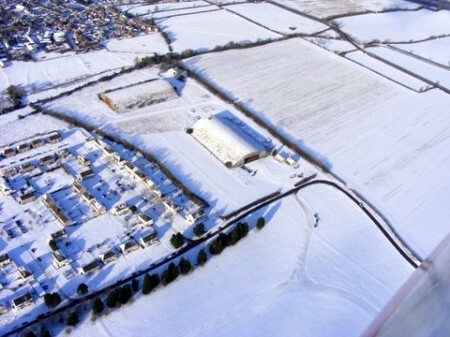 The recent January snowfalls grounded the GRP Viking gliders at Hullavington. Not so the sturdy, wooden, 60 year old Slingsby "Barge" which flew again giving pilots and passengers spectacular open air views of Wiltshire in white and a real feel for the sub-zero air temperature! No VGS Winch on Site…..
A low cloud Saturday morning in December with broken winch and no caravan left us with no way to launch our usual Viking gliders for the weekend and looking for other ways to get airbourne. Unless there is the odd hiccup! In the late afternoon the cloud cleared allowing us to fly the open cockpit “barge” into the early sunset of a cold, sharp December evening. A good way to end the day!